Elon Musk can exercise the option at a price of $31.17 a share. LOS ANGELES (Bloomberg) -- Elon Musk, Tesla Motors Inc.'s CEO and co-founder, was granted an option to buy 5.27 million shares in the maker of luxury electric cars as part of a long-term compensation plan to keep him at the company. Musk, already the largest stockholder of the electric car maker with a 25.8 percent stake, can exercise the option at a price of $31.17 a share, according to a regulatory filing Wednesday. The option, granted Aug. 13, has a 10-year term and vests in 10 equal installments based on the company meeting certain milestones, according to the filing. The stock option is the first since Dec. 4, 2009, for Musk, Tesla said in an Aug. 2 filing. He currently has an annual base salary of $33,280, according to that filing. 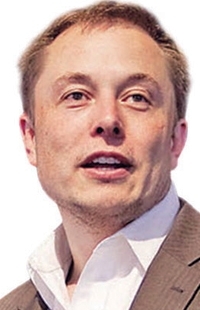 Musk, 41, also leads aerospace company Space Exploration Technologies Corp. and is chairman of solar panel installer Solarcity Corp.
Tesla is ramping up production of battery-powered Model S sedans at its Fremont, California, plant with a goal of delivering 5,000 this year and 20,000 in 2013. Musk expects the company, named for inventor Nikola Tesla, to report its first profitable quarters next year. Goals for Musk's options to vest fully include Tesla's market capitalization, now $3.1 billion, reaching $43.5 billion; development and production of the Model X SUV and lower-priced "Gen III" electric car; gross margin of 30 percent or more for four consecutive quarters; and aggregate production of 300,000 vehicles, according to the Aug. 2 filing. Tesla fell less than 1 percent to $29.40 at the close on Wednesday in New York. The shares have gained 2.9 percent this year.